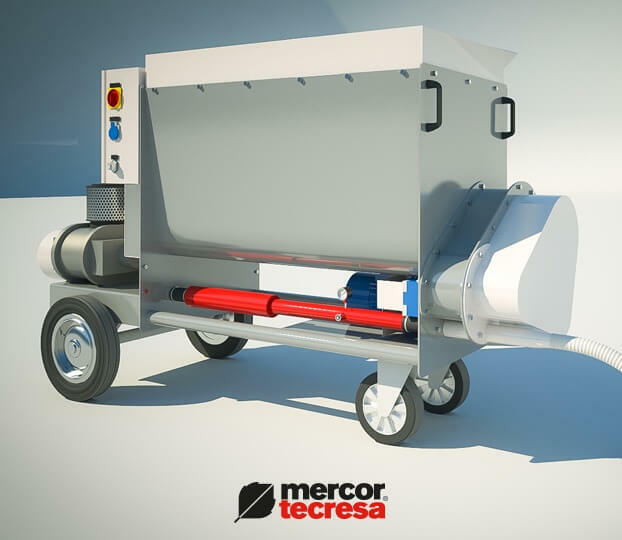 Tecwool®F and Tecwool® T mortars require a pneumatic spraying machine that applies the dry product by means of a hose blower to the spraying nozzle, which is equipped with a water intake and water sprayer for the proper hydration of the mortar. Usually, technicians and installation personnel presume our Tecwool mortars can be applied by plaster or concrete mortar spraying machines. This application method is not possible due to the nature of the product since it requires a “dry” impulsion and the mortar is mixed with water at the nozzle head. 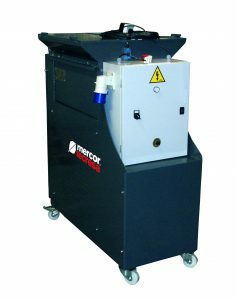 This pneumatic spraying machine provides a 250 linear metres hose. This allows the relocation of the machine at the worksite and apply the mortar without moving it. It provides a 10 C.V blower and a remote control to switch on/off the product supplying when needed. This blowing power is the main difference from other spraying machines, like cellulose or insufflation products application since they have a lower emission capability. It also provides a big volume hopper (1,3m3). A single operator can fill the hopper and apply the mortar without filling it regularly. This machine weighs 517 kg and uses a 380 V triphasic power. We provide a smaller version of the machine too. It weighs 260 kg and has voltage input of 220 V. This machine runs perfectly for retouching, hardly accessible or small-scale works. Need more information? Download the technical data sheet or contact us.